Residents now face a long effort to pick up the pieces. 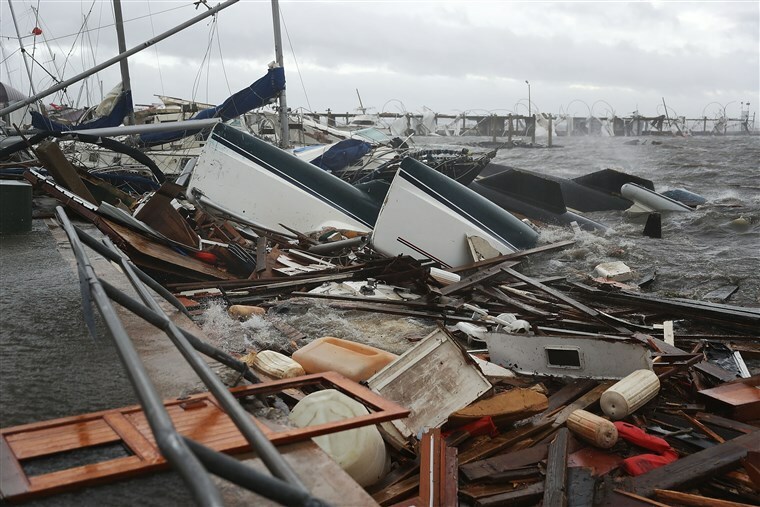 At least two people are dead as Michael continues to work its way through the southeastern United States. Wednesday, the Category 4 hurricane hit the Florida Panhandle with frightening fury, leaving behind widespread damage. As I posted next door, I’m betting there’ll be some building code changes post-Michael. We’ve been watching the damage pix and comparing them to Andrew and Katrina – they look more like Andrew to us. They mentioned, in post-Andrew reviews, how the building codes were relaxed to allow faster construction to meet the needs of the booming population (and increase the tax base) and how inspectors were lax or crooked – or both. Walls and roofs were built out of light pine or manufactured wood frames covered with OSB or particle board stapled in place. Bricks were layered on but only provided a decorative touch, as the winds flexed the structure the bricks popped off. A lot of the damage on the news looks a lot like that. We have wooden houses well over 200 years old in NOLA that have withstood numerous hurricanes with biggies such as Betsy, Camille and Katrina pounding them when they were well into their dotage. It’s all about construction techniques. We’re still well within the hurricane wind damage area where we live and this area’s also a tornado alley. We built with concrete as it was faster and cheaper than frame building at the time and we’re pretty secure feeling. There are plenty of folks who moved up here after Katrina who built with the same quick framing style that failed in NOLA – we’ll just have to wait and see.